Inquiring minds are noting that Foreclosures Grow in Housing Market's Top Tiers. About 30% of foreclosures in June involved homes in the top third of local housing values, up from 16% when the foreclosure crisis began three years ago, according to new data from real-estate Web site Zillow.com. 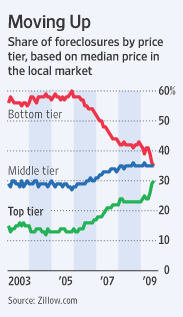 The bottom one-third of housing markets, by home value, now account for 35% of foreclosures, down from 55% in 2006. The Zillow research compared homes against the median values for their local market and broke each market into three tiers by value. Zillow then looked at the share of monthly foreclosures in each tier over the past decade. Default rates are particularly high and expected to rise on option adjustable-rate mortgages, which allow borrowers to make minimum payments that may not cover the interest due. Monthly payments can increase to sharply higher levels after five years or when the outstanding balance reaches a certain level. A study by Fitch Ratings found that 46% of option ARMs were 30 days past due last month, even though just 12% of such loans have reset to higher monthly payments. Zillow estimated that nearly one in four homes with mortgages was worth less than the value of the property at the end of June. Mr. Humphries said he didn't expect to see foreclosure volumes level off until later in 2010. Not only are foreclosures increasing, the value at risk is rising because of the shift to more expensive homes. The big hit comes when Pay Option ARM holders simply decide to walk away. The Washington Post notes that Bank of America Scrambles to Modify Loans Ahead of Government Deadline. Please consider Racing the Clock to Avoid Foreclosures. Bank of America employees are reminded every day of how far they still have to go. Just outside the elevators of their vast third-floor command center, attached to the wall, is a cardboard thermometer that shows them inching toward their goal of signing up 125,000 struggling borrowers for a federal program to modify their mortgages. The company faces many of the same challenges as other major lenders addressing the foreclosure crisis. But with weeks remaining to meet the November deadline set by the Obama administration, Bank of America is trailing well behind the other large banks, according to Treasury Department data. The company's effort has been hamstrung by a staff shortage and by adapting its computer systems and even fax machines to the scale of the program, which began in March. The company was also slow out of the box because it initially took a more conservative approach than some other banks, requiring that borrowers document their income and complete other paperwork before granting preliminary approval for a modification. In August, Bank of America softened the requirement and began authorizing some modifications without getting all the documents first. Adding to borrowers' difficulties was a letter sent this summer by Bank of America that mistakenly informed some of them that they did not qualify for the administration's foreclosure-prevention program because their loans were not backed by Fannie Mae or Freddie Mac, the government-controlled mortgage giants. "Bank of America is not actively participating in this program," the bank wrote to some borrowers, according to a copy of the letter obtained by The Washington Post. A progress report released last week by the Treasury Department showed that only 11 percent (about 95,000) of Bank of America's delinquent borrowers who were potentially eligible for the program had been given a loan modification. That compares with 27 percent, or 117,000, for J.P. Morgan Chase, and 33 percent, or 68,000, at Citigroup, the Treasury reported. The figure for Saxon Mortgage Services, which is owned by Morgan Stanley, is 41 percent, or 32,000. Many of the 62 other mortgage lenders participating in the government program have also ramped up, industry officials said. Wells Fargo reported that call volume tripled after the program was announced in February, prompting the company to hire an additional 5,800 employees to address loan modifications this year. Citigroup increased its loss-mitigation department from 450 employees in early 2008 to more than 4,000. J.P. Morgan Chase switched from a paper fax system to an electronic one to handle the volume of documents being submitted by borrowers. Even after top Treasury officials called in industry leaders for a series of meetings on the program in July, chastising them for their poor progress, the foreclosure crisis continues to worsen. Borrowers are becoming delinquent on their mortgages at record rates, and rising unemployment rates are exacerbating the problem, economists say. Already, 4.4 million borrowers have lost their home since the mortgage crisis began in 2007, and another 2 million will this year, according to Moody's Economy.com. Bank of America and other lenders have a lot riding on the foreclosure prevention program. The company stands to collect about $6 billion -- some of which will be passed on to investors -- of the $75 billion the administration has set aside for the Making Home Affordable program. At the same time, the banking industry faces a threat from senior Democrats in Congress who may revive legislation allowing bankruptcy judges to modify mortgages if more is not done to help borrowers. Last week, Sen. Jack Reed (D-R.I.) introduced a bill allowing a borrower to fight a foreclosure in court by arguing that the lender did not offer a loan modification. There's much more in the article including examples of people turned down for modifications for various reasons. Those examples show just how hopeless this mess is. For those mods that do go through, I expect the work-outs to be temporary and for problems to resurface. Without jobs, many of the modification participants cannot afford to make any payment. Of those who can afford payments are a class of people whose best interest is to walk away regardless. Here's the deal. These modifications schemes are attempting to make the payments affordable whereas the real problem is the huge positive incentive for those underwater on their homes to simply walk away. Restructuring payments cannot possibly fix a problem of debt levels being too high. Nor can restructuring payments help anyone out of a job, unable to afford any payment. Those on the upper end of the economic scale are more apt to understand the situation than those on the lower end of the economic scale. High end foreclosures can be expected to increase for this reason, even for those with a good paying job. At the low end of the economic scale, only those with a job can benefit. Yet, even then the odds are most program participants would be better off walking away than becoming debt slaves to an overvalued residence. Some will eventually figure this out. Others will find that even a lower rate is not enough to keep them in their house. Still other will lose their job in the next 1-2 years and be forced out of their homes. Huge numbers of modifications are in the works. Just don't expect any miracles. None are coming.